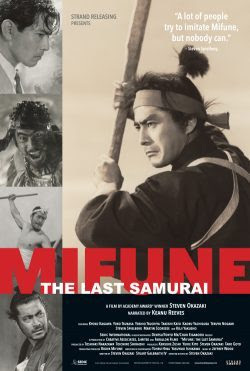 Or rather some of his movies since MIFUNE is largely focused on Mifune and the films he made with Akira Kurosawa and specifically his samurai movies. We get to know the man in connection to those films (and the Samurai Trilogy) in detail and the rest is reduced to breezy and enjoyable commentary . And there is the rub, while the film is full of great stories and insight into the films it covers there is so much that isn't here. His personal life is reduced down to a few key moments and his non-Kurosawa films to stills or quick clips. And it's odd because Mifune made over 180 films in his career, and even his non-samurai Kurosawa films are interesting enough that they could be discussed. There was a complexity to the man and his films that is only hinted at. I never really got the feeling that I knew the man except in the off fleeting moment. Watching the film I'm left to ponder if my reaction to the lack of completeness a general unhappiness with the brevity of the film, it runs about 80 minutes, or is it because I have a sense of Mifune's larger body of work. While there is no doubt that Kurosawa is of key importance, and some would say they are the only films worth mentioning, but he did turn out a fine body of other films even if they were just entertainments (RED LION, his Zatoichi film or even some of his American films). Hell I would have liked some more discussion of Kurosawa crime films like DRUNKEN ANGEL or STRAY DOG where the director and star first met and formed a relationship that would mark both of their careers. In a weird way, as much as I liked the film I was kind of disappointed. Don't get me wrong I like the film. What is here is gangbusters, but there should be a hell of a lot more. Actually what this should have been is simply a film that was a biography of both Kurosawa and Mifune's relationship and then I could understand the brevity. Recommended for fans of Mifune with the warning this is snack not a meal. MIFUNE THE LAST SAMURAI opens in theaters Friday.